I baked this cake for my daughter’s birthday. She just loves strawberries. Strawberries make a regular appearance on her waffles in the morning and her favorite flavor ice cream is none other than strawberry. I’ve always wanted to bake birthday cakes from scratch for family birthdays but have always seemed to be too busy to do so. This year, I’ve made a resolution to make more homemade cakes! Homemade cakes are just. so. much. better than most store-bought cakes. This cake didn’t disappoint. One of my favorite parts was the candied strawberries. I didn’t even know that such a thing existed, until I came across them one day while reading another blog. You can find detailed instructions on how to make there here. If you like candied apples, you will love these cuties. 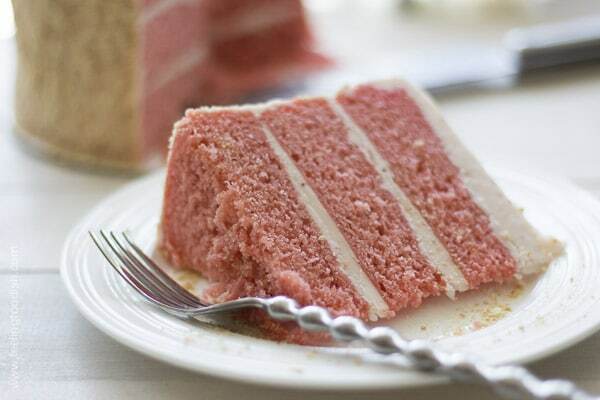 Anyway – back to this cake – it was inspired by the Good Humor strawberry shortcake ice cream bars. 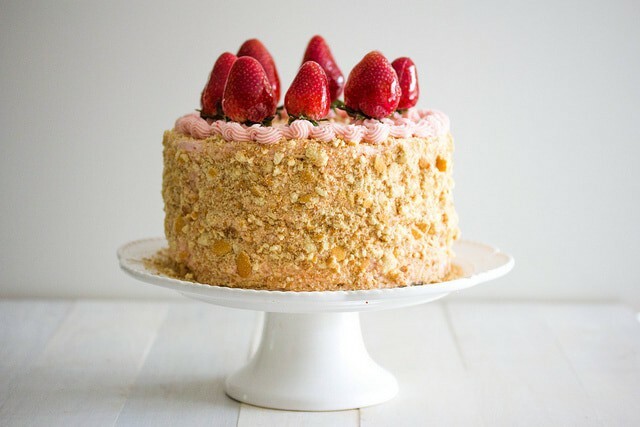 To get the true effect, serve a big fat wedge of this cake with a scoop of vanilla ice cream and don’t forget to use the cookie crumbs when decorating. 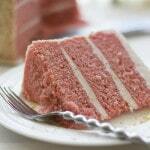 A moist strawberry layer cake inspired by Good Humor strawberry shortcake bars. Prepare three 8-inch cake pans by buttering, flouring and lining with parchment paper. Using a standing mixer fit with a paddle attachment, cream butter, gelatin powder, and sugar together until light and fluffy - beating for at least 5 minutes. Add the flour mixture in 4 increments and milk mixture in 3 increments, alternating between the two, beginning and ending with the flour mixture. Do not overmix at this point - combine only enough to incorporate ingredients. Bake for about 30 minutes or until a cake tester comes out clean and edges pull slightly away from cake pan. Can begin to test only after 20 minutes. Do NOT open oven before 20 minutes or your cake may fall.